Please note that the content of this book primarily consists of articles available from Wikipedia or other free sources online. 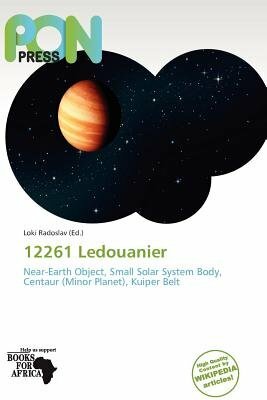 12261 Ledouanier is a main-belt asteroid. The asteroid belt is the region of the Solar System located roughly between the orbits of the planets Mars and Jupiter. It is occupied by numerous irregularly shaped bodies called asteroids or minor planets. The asteroid belt is also termed the main asteroid belt or main belt because there are other asteroids in the Solar System such as near-Earth asteroids and trojan asteroids. Maybe half the mass of the belt is contained in the four largest asteroids: 1 Ceres, 4 Vesta, 2 Pallas, and 10 Hygiea. These have mean diameters of more than 400 km, while Ceres, the asteroid belt's only identified dwarf planet, is about 950 km in diameter.